Sights & Scents of Tangier "with private transportation included"
Aziz was a delightful and informative guide to a fascinating city. Clearly a rock star among guides, I think he knows everyone in Tangier, and everyone knows him. I wouldn't wander the narrow pathways of the Old City alone, we couldn't have had a better guide than Aziz. Excellent tour by the best guide you can wish for. This is the way to see the tourist sites before the cruise busses arrive and then sites those bus passengers don't see. My husband and I just returned from our trip to Spain. One of my highlights was our day trip to Tangier, Morocco. Aziz ensured that everything went smoothly. He began communicating with us weeks before the trip to ensure to give us tips, lend us a hand to book the ferry etc. Once we arrived he received us with a sign and everything was well planned and organized. He was full of knowledge and was able to incorporate things to the itinerary according to our likes. I can't recommend Aziz enough! Great job. Azizz was an excellent guide. He met us at the ferry took us to our hotel to check in and drop off our bags. He gave us a great explanatory tour of the city of Tangier. The walking tour was great and very interesting with some great sights. He took us to a Restaurant visited by only the locals that was superb. The driving tour of the city was also very informative and greatly enjoyed. Azizz dropped us off at our hotel shook our hands gave us his card and told us to call him personally if we had problems. Aziz (or Aziz No. 1 as he likes to be called) was very knowledgeable, especially about the history of Tangier, but he has an annoying tendency to repeat every 30 minutes or so that he is the best tour guide in Tangier and we were getting 5 times more info than on any other tour. We could have used less horn blowing. His driver (Ahmed) was excellent, and in fact, the last hour of the tour was spent just with Ahmed (without Aziz). TOUR GUIDE RESPONSE: Thank you for your comments and feedback - it was nice to meet you and I am happy that you enjoyed my commentary about the history of Tangier; however, I am sorry that my attempts at humour took away from your overall experience." all I can say this was the worst experience of our trip using tours by locals. not knowable at all and unable to communicate anything. must avoid. Booking a tour is definitely the way to go. Aziz, as well as our driver, are extremely knowledgeable & friendly. We did what he suggested & he ensured our one day was packed with interesting sights we never would have seen if on our own. 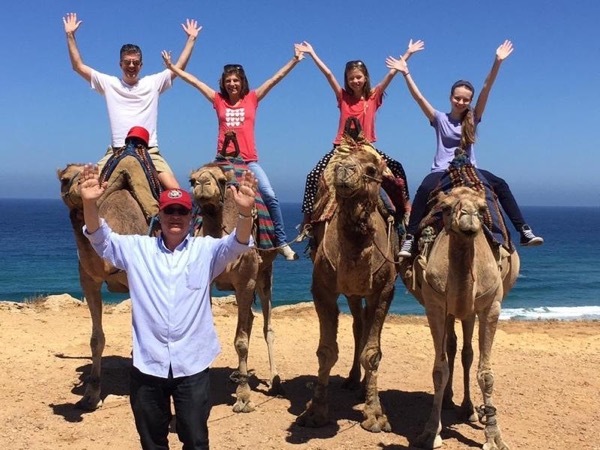 He booked our ferry from Tarifa, chose a superb restaurant for lunch & arranged a camel ride. We particularly loved going through the Kasbah that is a feast for the eyes. I treasure the souvenirs we bought. We highly recommend Aziz! Thank you for a most memorable day! I booked a tour of Tanger for myself and my grandson with Aziz. Aziz was very helpful before during and after Are Tour. He helped arrange for Ferry transportation to Tangiers from Tarifa and once we arrived he had a car waiting for us. He picked us up from the hotel in the morning in a Mercedes with a driver Mohammad. He gave us a short tour of the important sites around Tangiers and then took us into the Casbah for a fabulous tour. Aziz is extremely knowledgeable and I highly recommend this tour. We were MOST fortunate to have AZIZ as our guide. We had a wonderful time and experience. This was mainly due to the wonderful organisation done by AZIZ. He knew everyone and everyone knew him. He got us into places that we would not have otherwise visited. We arrived 2 hours early (unknown to Aziz). When we mentioned his name to those trying to 'sell' us tours, one rang Aziz and a taxi appeared instantly to take us to a local Cafe where Aziz met us shortly thereafter. Amazing. A fantastic tour followed. Absolutely the best way to get to know Tangiers in a single day. Aziz and his driver Ahmed were at our beck and calling. We felt like notorieties. Aziz met us at the ferry landing and dropped us off to return, and catered to us all in between for the whole day. Personalized service, fluent English, courteous and personalized attention, knowledgeable history and local attractions.... all at a very reasonable price. We came over for the day from Spain, and adding Morocco with Aziz to our trip was special! We would give Aziz 5 stars. He is a fount of knowledge, and a delightful person, funny, personable, and a great listener. He tailors the day to your wishes: want to shop for leather? He knows the quality craftsmen. Interested in spices? He will take you to the best vendors. If history is your thing, he can wax poetically on Moorish conquests or Roman influence. If you are happy to just to follow his lead, you will have a great day. We had a magical time with Aziz in Tangier! He refers to himself as "Aziz #1", a designation with which my wife and I would heartily agree. Initially we drove around the city, with interesting commentary, with a stop at a local coffee shop/bakery, Aziz's treat! The highlight was our walks, first through the residental Casbah and then the markets of the Medina. A unique experience! Finally, a memorable meal at a "locals" restaurant that was spectacular. Huge prawns, Moroccan style fish, sides and more! Abdelaziz (a/k/a Aziz #1) provided my wife and I not only with a wonderful tour of Tangiers, but also with a wealth of historical and cultural backgroud and context. We have hired private guides for many the places we've visited in recent years and we would count Aziz among the best and most enjoyable we've toured with. Aziz made the whole process simple and easy. He was quick to respond via email and he was waiting for us at the dock. He is very engaging. We immediately stopped for coffee and spent a few minutes getting to know one another. We loved going through the old city and its markets. Having Aziz kept overbearing street vendors at bay and allowed us to enjoy the sights without being bothered. We shared a wonderful meal and at the end, he took us all the way to the customs line. We highly recommend him. One of the most memorable days we have ever had! Our kids loved it. What a fabulous day with Aziz! If your looking for a true tour by a local, this is your tour! We felt like we were spending a day with our good-old "uncle Aziz", who was showing us all the best parts of his hometown! Being guided through all the small winding streets of the Kasbah and the bustling neighborhoods of Tangier would not have been possible for us in only one day without Aziz! 5-star tour! Aziz was a knowledgeable and entertaining guy! He met us promptly at the ferry and off we went! He had his driver Speedy at the ready to whisk us away into the city. He walked us through some interesting locations, including a locals food market that was amazing, the medina and kasbah, a huge marketplace full of handcrafted items and rugs. Be prepared to be firm if you don't want to buy! We enjoyed a delicious, traditional moroccan lunch. We were delivered back to the ferry, the end to a great day! Today we were fortunate to have chosen another fabulous tour guide! Addelaziz was a quite a character, he was warm, funny and very very knowledgeable! Walking through the old town with him was quite an experience, since every five minutes, someone stopped to shake his hand or give him a hug! He quickly tailored the tour to fit our interests, such as taking us to a very old synagogue. We went to fabulous store to shop and were able to ship home our purchases. And lunch was AMAZING! We had such good time! My advice: Aziz is the only Tour Guide to use in Tangier. From the moment our Ferry arrived from Tarifa (the only ferry to consider), Aziz made us feel welcome, comfortable, and confident that we would experience all the highlights of Tangier. From the newer part of the city, to the Casbah, the market place, Old Town & a close up of a dozen paintings by Henri Matisse . A fantastic lunch at a great local restaurant was followed by a trip to Cap Spartel and Hercules cave. Aziz arranged the perfect day! While definitely on the pricey side, Aziz and our driver, Omar, did deliver a jam-packed, fascinating introduction to Tagiers. Aziz answered all my pre-tour questions promptly and thoroughly, met us at the port with a placard with our name, and provided a very comfortable, roomy vehicle. His English is excellent, as is his knowledge of the city. We visited many spots not typically available and our elaborate fish and seafood lunch was amazing. Fantastic, knowledgeable and professional guide. He loves the work he does and the city he shares. His attention to detail and his full attention made us feel excited about being in Tangier. He honoured every requests we had as to sights in addition to the planned tour. His flexibility allowed us to enjoy and experience Tangier thoroughly in a short stay. Highly recommend this guide and his driver--five stars plus! Aziz is by far the number one tour guide! I took my two sons 16 and 23 to Tangier for the day. We told him that we did not want to do touristy things and we wanted to see special sites. He and his driver Omar were wonderful and he even took us to lunch at his favorite restaurant for the experience of a local. We walked all over the city and he showed a special places that he normally doesn't take tourists. It was a very special day and a very special experience! Mr. Aziz did exactly as he promised; he took me down the side streets in the Medina where no other tourists were located. It was so peaceful and beautiful walking along these narrow alleyways when the call to prayer came over the sound systems from the Minarets. One word of caution to my fellow travelers: Do your homework before you consider buying anything. Know your limits and what you are willing to pay. Mr. Aziz did not lead me astray, but I should have known how to haggle for a rug I bought. Aziz and his drivers were very good. We really enjoyed the camel ride! Those men were great! We enjoyed Morocco very much. Aziz tells us he is Aziz #1 and we can confirm that he truly is. Aziz and Omar were outstanding tour guides. They showed us a Tangier that could not be imagined as we found the city to be friendly, interesting and so much fun to explore - all because of Aziz and Omar. We didn't want to leave! Everyone in Tangier knows Aziz and that is what makes this tour a personal experience. Aziz, you are the best and Omar - you are excellent driver and you both took care of us. Thank you! I cannot overstate the pleasure my wife and I enjoyed from meeting and touring with Abdelaziz. He is rightfully greeted frequently on the pathways of Tangier as "Number 1." He is warm, cheerful, extremely knowledgeable of local history and customs, and careful to stay in frequent contact prior to the tour to ensure your comfort in understanding the tour's possibilities. He even uses the camera you brought to take pictures of and for you during the tour. Abdelaziz is a delight and I recommend him totally. TOURSBYLOCALS RESPONSE: ToursByLocals are committed to quality customer experiences and are always happy to receive your feedback; so please do not hesitate to reach out to us with any comments about your tour. We received an excellent tour, personalized and tailored to our needs. It was educational, entertaining and thoroughly enjoyable. We highly recommend tours by locals. Abdelaziz ensured we had a great experience. We arrived via ferry from Spain & Abdelaziz was quite helpful in getting us through customs coming & going (it was slightly tricky & his help was welcome). The tour included a stop at a craft coop - good crafts/merchandise, not tourist schlock - but we did not appreciate the coop clerk's pleasant but persistent pressure to buy a rug (good stuff, though). Without the craft coop, the tour would have rated 5 stars. Mysterious Tangier was brought to vivid life for us by our guide Aziz Number One (as he refers to himself!). It must be a challenge to try and distill this large, exceptional and multicultural city into an 8 hour tour, yet somehow Aziz managed to do it in a way that did not feel rushed. I believe he was trying to have us experience the city at a "Tangierian" pace. Highlights were the food market in the old city and the Casbah. The former, intensely olfactory; the latter hauntingly beautiful. Recommended. Had a great day in Tangier with Aziz. We had an excellent overview tour of the city and neighbouring coastline. This was a great tour. Our guide Aziz and driver, Speedy were excellent. They were very informative and knowledgeable. On the croded streets and pathways, we always felt safe with them.I loved the help Aziz was in obtaining our ferry tickets and arranging camel rides. Aziz provided an overview for the day after asking me about my interests. The gentlemen were polite, professional and friendly. As a solo traveler and female, I felt safe in their presence. Aziz was funny and steered me to places not normally found by tourists. All in all, a wonderful day! What a terrific day we spent with Aziz!! His knowledge of Tangier was amazing and he did a terrific job of showing us all of the important sights of this beautiful city! We felt completely at ease with Aziz as he led us through the narrow alleys of the Kasbah and the Grand Socco markets. He made sure we had a safe and enjoyable experience which included a delicious lunch at a local restaurant. His English was excellent so he could communicate all of the important history and culture of Tangier. Mr. Abdelaziz arranged a customized tour for us with an associate, Abdul, as we were booking at the last minute. It was the best money that we have ever spent on a tour as he was extremely knowledgeable; it was self-paced and we saw things that we'd have never hit on a group tour, however small. Mr. Abdelaziz even met us at the ferry for our trip back to Tarifa, to ensure that we were completely satisfied -- everything was way above and beyond expectations. Aziz is fantastic. Very caring and knowledgeable. He is just a person that will make the difference in your trip . Having a good guide will change your total perspective on the country it will offer a total different view for you at what is really there in front of you . When you're on vacation you want to have a happy guide that makes your day worthwhile and create new memories for you that are worth remembering . I recommend this company and I recommend Aziz to anyone that wants to all. Would thoroughly recommend Aziz who has been providing tours for thirty years and he is a font of information and knowledge. We had a wonderful time touring both the new and old cities by car and on foot. Keep up the good work we really appreciated your efforts and answers to the many questions you fielded. I would highly recommend Aziz to anyone wanting a comprehensive look at the peoples and cultures of Tangier. We had a delightful day with him. Aziz is the most amazing tour guide!! We saw a bit of the Kasbah area and then took us to the food and fish market. Wow!!! Amazing food, such beautifully arranged produce, olives, spices, meats and then the fresh fish market! Aziz picked out some beautifully fresh shrimp, swordfish and John Dory fish. We took a cab to a local restaurant where the very capable chef cooked our seafood right there with us in the kitchen watching. Then our meal was served to us in the dining room. What a great experience! Aziz organized the excursion. We had a driver (very good) to Tetouan and then another guide in the medina. The medina was interesting, very primitive, and quite a contrast from the much more modern Tangiers. The English of all the men involved in the tour was adequate, but heavily accented. TOURSBYLOCALS RESPONSE: Aziz was ill on the day of the tour, and arranged for a driver and guide to conduct the tour, staying in contact with the group by phone throughout the day. There wasn't enough interaction between guide and us. He said around 150 words in the 4 hours that weren't directives or commands. He took us to great places, but that isn't enough for a $350 tour. We wanted to know about the government, education system, women's lives, children's lives and we asked him questions about all of this and received one or two word responses. He showed us two places where Matisse painted and yet didn't bother to bring a photo of the painting. That would have been easy, but no. TOUR GUIDE RESPONSE: Thank you for your feed back! I am sorry you did not enjoy your experience with me. In fact, the day of your visit was the first day of Ramadan, the holy month. We fast from the sunrise to the sunset. Also, I was ill and did not wanted to cancel at the last minute or send a substitution guide. So, I was really tired. I am really sorry for what happened and hope you can accept my apologies. TOURSBYLOCALS RESPONSE: The guide and his guide support manager were made aware of the comments above and as per the guide's request appropriate compensation was issued to the customer. Aziz was great! He covered all the sites that we were interested in and we came away with more of a "beginner's knowledge" on Tangier than we would have expected. We recommend him without hesitation! The tour provided was just as advertised. I was especially pleased with the promptness and courteousness of the communication with Aziz. He immeidately answered my email questions and even sent me a text on my phone the night before the tour to confirm that I was still scheduled to arrive in Tangier on the ferry the following morning. He coordinated well in having other drivers transport us during the tour and then met back up with us afterward. He was very organized, and I highly recommend him.